NOTE: This is the third of a four-part series chronicling OregonMania, where two guys basically ate a bunch of food in Oregon over Memorial Day weekend. Sunday, May 27, was the third day of OregonMania. With the rest of our stops taking place in Salem, Naader and I were spared the long, monotonous drives on I-5. A relatively calm day for the Freak awaited, while the Spicochist turned things up several notches. After we each got in our separate morning gym sessions, it was off to Odd Moe's Pizza, a pizza chain with several locations throughout the Salem-Keizer area. We went to the one just off Lancaster Drive NE, where I had been in constant talks with the manager, Michael, over the last few months. It started with developing a hot sauce recipe for a pizza. We then created a wing challenge (Suicide Squeeze Challenge), where "pros" (likely people with food challenge experience) must eat 10 spicy wings in three minutes. "Amateurs" get five minutes to consume the ten wings. Two types of sauce were born: "Hurts Once" (5-pepper blend using a tomato base) and "Hurts Twice" (8-pepper blend, orange-yellow in color, virtually all peppers). Hurts Twice contains a healthy dose of Trinidad Scorpion pepper, while the "Hurts Once" merely contains remnants of that spicy beast. With the lack of food challenges in Salem -- and knowing Naader loves pizza -- I contacted Mike about constructing a possible pizza challenge. With the largest pizza being 16", I knew that would be a cakewalk for the Freak. I had a quantity challenge in the works at Church St. Pizza, so I needed to find another way to get this challenge off the ground. 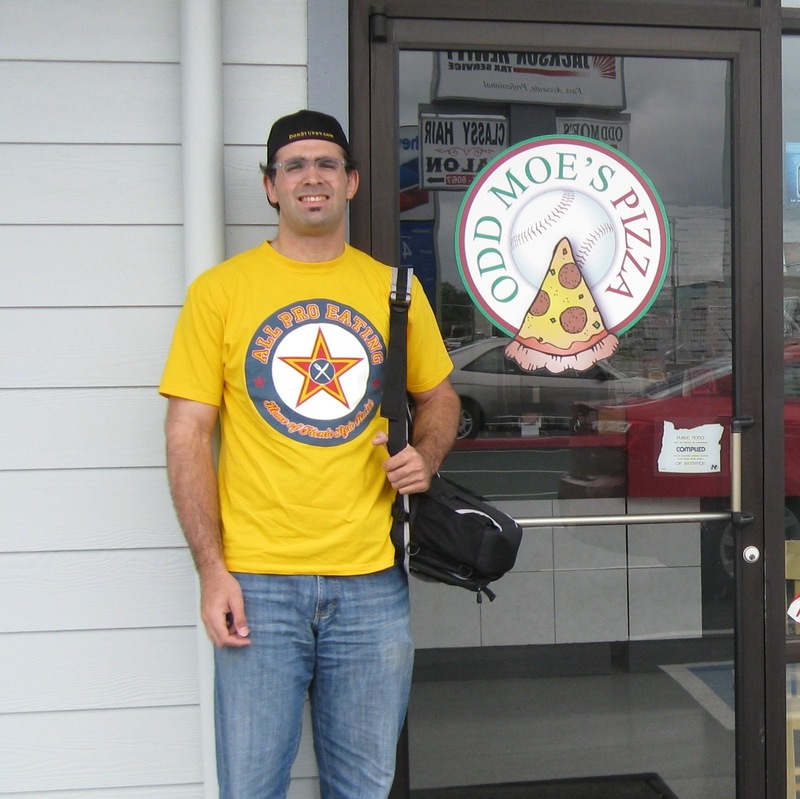 Eventually, around the 11th hour, Mike, Naader, and I all agreed on a speed challenge for Odd Moe's "Triple Play Special." Basically, Naader would eat a 12" combo pizza, 10 spicy wings (same as the aforementioned wing challenge), and a pint of ice cream as fast as he could. We set it for Sunday, around noon. A slight miscommunication delayed the start of the challenge, but soon enough, it was all set to go. The Freak demolished the pizza first. Even the "Hurts Twice" wing sauce coating couldn't stop this Freak. The ice cream was cookies 'n cream, polished off in about 2:15. Naader signed the challenge poster! Final time? About 11 minutes. Wow. Winner winner Freaky...lunch. After a bit of chatting at Odd Moe's, Naader and I made a quick pit stop at my apartment to grab my incinerating hot sauces. We then hit Buffalo Wild Wings, which just opened its Salem location the week prior. I knew I was getting something with Blazin' sauce, but wasn't yet sure on exactly what to get. Going inside, I spotted a Memorial Day special: 25 wings (boneless or traditional) for $14.99. Score. They certainly smelled like Blazin' boneless wings. But I needed more spice. A noticeable amount of habanero sauce, Trinidad Scorpion hot sauce, and Wanza's Wicked Temptation went on the already-fiery breaded poultry. A bunch of chewing, very crunchy nuggets. The heat was mild at first, then increasingly intensified. By the 15th one, I had to reach for the water. Still ten to go. Ouch. 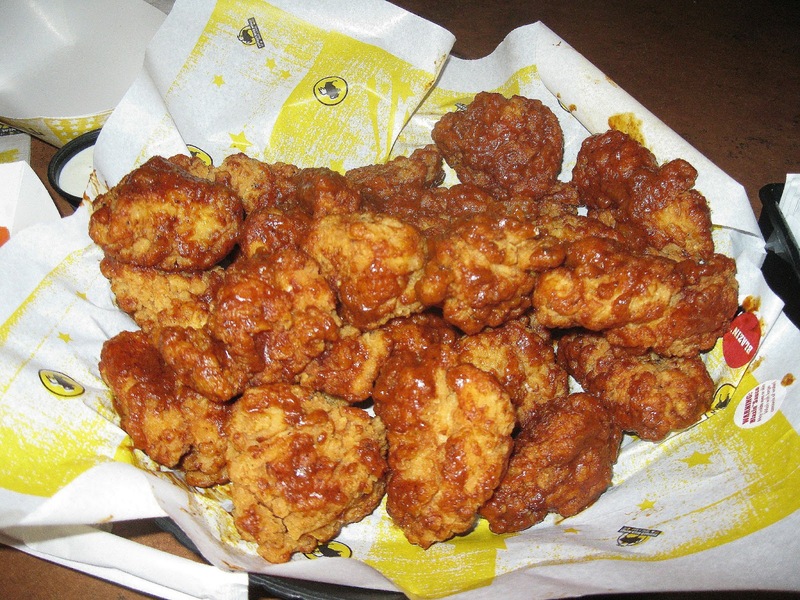 Each boneless wing shot more pain in my mouth and down my throat. I perspired quite a bit, so I'm sure I could call this a second workout. Even repeated sips of water did very little. But no quitting here. Not allowed. I swallowed the last of the boneless wings -- plus carrots and celery -- around the 17-minute mark. Yeah, they gave me ranch dressing, but I despise that stuff. Bonus video of me kicking up those Blazin' boneless wings with more hot sauce during OregonMania! 25 kicked-up Blazin' boneless wings down the hatch! Basically, it was a short day three. We both had to rest up for the main event at Church St. Pizza. While Demitri (owner of Church St. Pizza) constantly hyped Naader's challenge -- even getting the attention of the local paper, the Statesman Journal -- mine virtually went under the radar. Regardless, both of us would take our final bows doing what we do best.